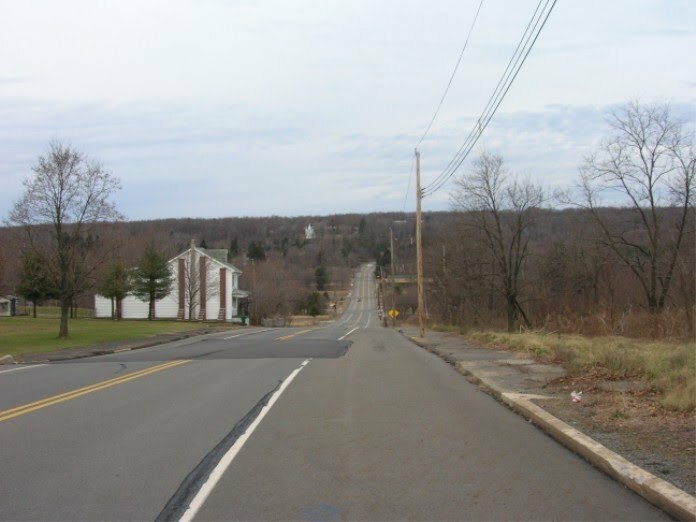 Centralia is nestled in the southern region of Pennsylvania’s Columbia County: home to the largest anthracite coal deposit in the world. It is approximately 120 miles northwest of Philadelphia, far removed from the hustle and bustle and situated in the Appalachian region of rural Pennsylvania. 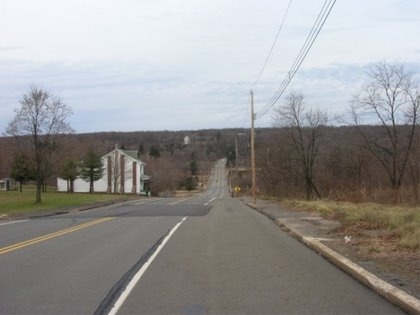 Centralia was once a prosperous coal mining town. In its heyday, the population was over 2,000. Today, it is less than 9. Since the mid-1800’s, the anthracite coal industry was the principal employer in Pennsylvania’s coal region. Coal mining in Centralia continued well into the 1960’s until oil and natural gas cartels usurped the monopoly on the fuel market. But prior to natural gas and oil dominating the public’s need for home heating fuel, anthracite coal was king. Homes, businesses, and schools throughout Pennsylvania and much of the northeastern states mostly relied on coal for winter heating fuel. 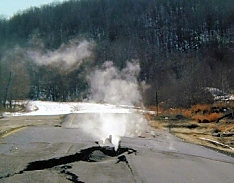 Centralia acquired the rights to the coal from the coal mining conglomerates in 1950 – the only Pennsylvania coal mining community to take advantage of a 1949 state law allowing such purchases. Anthracite is a very hard variety of coal with a high luster. It also has the highest carbon content and least amount of impurities of all coal. It is also much rarer than the more common and much softer bituminous coal. Anthracite coal is of the highest metamorphic rank; its carbon content is between 92-98%. The metamorphic rank of coal corresponds to the amount of hydrocarbon vapors given off when the coal is heated below its ignition point. In other words, the higher the metamorphic rank, the cleaner the coal burns. Anthracite coal is very difficult to ignite, but once ignited, it burns with a short blue smokeless flame. The moisture content in anthracite coal fresh from the mine is less than 15%. The heat content ranges from 22-28 million Btu per short ton (26-33 per Mega Joules/kg). Pennsylvania is home to the largest deposit of anthracite coal in the world, home to 7 billion short tons of minable reserves. America’s anthracite coal use as an energy source began after it was experimentally burned as a residential heating fuel on the open grate of the fireplace in the home of Judge Jesse Fell in Wilkes-Barre, Pennsylvania on February 11th, 1808. From then onward until the 1960’s, anthracite coal was the most popular fuel. It burns with very little soot and delivers a very high energy output. After natural gas and oil supplanted the use of anthracite in the middle of the 20th century, use of coal became obsolete. As of June 2008, the going wholesale rate for anthracite was $150/short ton. Given the unaffordable prices of oil and natural gas, anthracite coal could be a very important energy source once more. However, the state and federal government did not foresee this when they collectively wasted this valuable fuel resource. 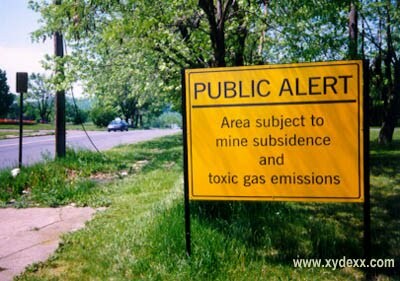 State and federal agencies bungled the salvage efforts of the precious coal from the devastating underground mine fire in the Buck Mountain coal vein that has been raging for the past 46 years; turning the once thriving hamlet of Centralia into a huge eco disaster and a ghost town. The fire started on May 27th, 1962 during a routine trash burning. An exposed coal seam near the surface caught ablaze. 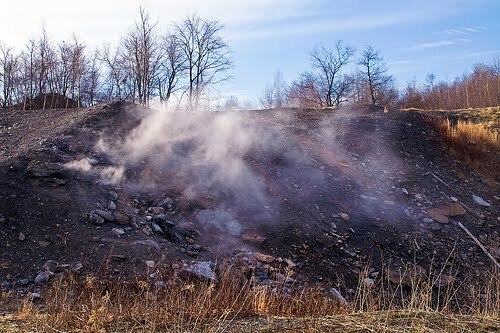 Although the borough’s volunteer fire department extinguished the fire on the surface, it was unknown at the time that the subterranean Buck Mountain coal vein had ignited and was on fire underground. The fire migrated throughout the labyrinth of abandoned mines beneath the ground underneath Centralia. Closed mine shafts interconnected with the Buck Mountain coal vein ignited. The fire raging down below was not discovered until a week or two after the trash burning incident. Extinguishing subterranean mine fires is tricky business. Anthracite coal ignites at around 225°C (437°F). Once ignited, it burns hot and steady. Some temperature readings above the Centralia inferno close to the Earth’s surface have reached as high as 447°C (805°F). The intense heat has caused subsidence and buckling, resulting in the permanent closure of PA Highway 61 North near Centralia. Underground mine fires typically must be extinguished by digging them out. The Department of Environmental Resources (DER) began monitoring the fire in July of 1962 after a local gas station owner discovered the temperature inside of the station’s underground gasoline storage tanks were abnormally hot when he checked the fuel levels. He stuck a thermometer down inside the tanks, and the temperature registered 172°F. A member of the Centralia Borough Council called Clarence Kashner in the nearby town of Shamokin in Northumberland County, a neighboring county in the coal region. Kashner was president of the Independent Miners, Breakermen, & Truckers – an organization of small mine owners and proprietors of coal hauling businesses. He was the man to go to for extinguishing mine fires. In fact, Northumberland County commissioners relied on Kashner’s expertise for the organizing of emergency mine fire extinguishing projects. This was paid for by the county. So, the borough council in Columbia County’s sleepy coal town of Centralia conferred with Kashner. 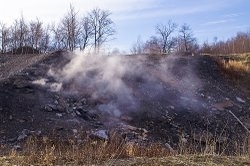 When Kashner arrived at the scene of the mine fire which started in the garbage pit behind the Odd Fellows Cemetary, he observed a large hole and a potentially major coal vein fire. Years of experience told him that this was a recipe for disaster in the making. Kashner called Gordon Smith, an engineer at the nearest Pennsylvania office of Department of Mines and Mineral Industries (DMMI), which was located in the neighboring small town of Pottsville. Kashner described his observations and told Smith that the way to extinguish the fire was to dig it out. Kashner further told Smith that he could do it for the sum of $175. Smith gave Kashner the common bureaucrat response, putting Kashner off with lame excuses saying that the approval for the project would first have to go through the appropriate channels. Kashner, a well-respected expert in the realm of mine fires, was infuriated. He understood the ramifications of delay and that prompt action must be taken when dealing with mine fires. Kashner told Smith that if the project was delayed, the DMMI would have a mine fire on their conscience. The DMMI bureaucrat replied with the typical, “I’m sorry, but there’s nothing I can do” response. While the DMMI twiddled its thumbs, the fire raged on. At the heart of the fire on the coal bed underground, temperatures exceeded 1000°F. As a mine fire migrates, it consumes the stabilizing timber supports in the catacombs of the mines. Once the support pillars are compromised, the heat destabilizes fill material and the ground above, causing subsidence. 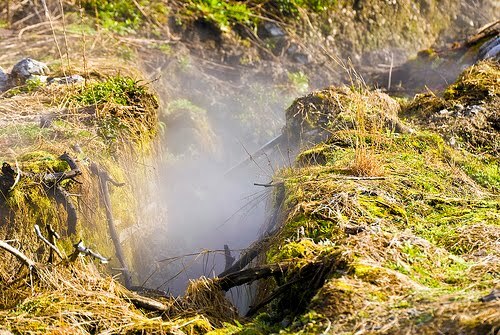 The result is an opening, a fissure, on the surface that spews toxic hydrogen sulfide gas and carbon monoxide. The depth and grade of the coal veins, the angle of pitch, make mine fires particularly difficult to control in the anthracite coal region as opposed to the bituminous coal region in southwestern Pennsylvania because bituminous coal veins are closer to the surface and relatively flat. Anthracite coal veins plunge deep, which provides a logistic hindrance to extinguishing a mine fire. This was all the more reason for DMMI to act fast as opposed to dilly-dallying with the usual bureaucratic red tape to solve the problem. The two government agencies in 1962 that could have and should have helped Centralia were DMMI and the US Bureau of Mines (BOM). The BOM operates under the aegis of the US Department of the Interior. The BOM and DMMI were staffed with mining engineers with the knowledge and expertise in fighting mine fires. But very little money was allocated for mine firefighting efforts. 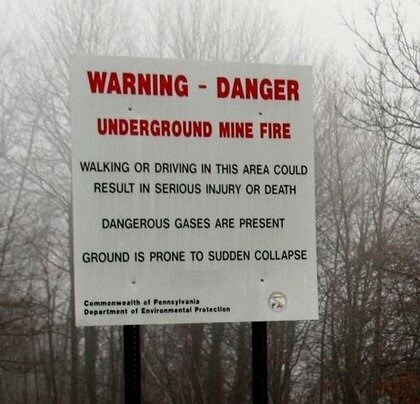 Key elected state and federal officials in Harrisburg and Washington, DC respectively had little concern, and even less understanding of the seriousness of mine fires and other hazards associated with abandoned mines in the anthracite region of rural Pennsylvania. Deputy Secretary of Mines James Shober, Jr. consulted with Charles Kuebler, the research director at the BOM Anthracite Research Center in Schuylkill Haven in Luzerne County, Pennsylvania on July 25th 1962. 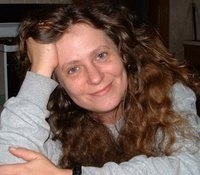 The two arranged for a meeting to be held at the Centralia mine fire site on August 6th. Representatives of the Lehigh Valley Coal Company and the Susquehanna Coal Company were invited to the meeting, but members of the Centralia Borough Council were pointedly excluded. The BOM and DMMI didn’t want to include local officials in the decision-making process, even though it was the locals who were immediately affected. One attendee at the August 6th meeting was Alonzo Sanchez, a strip mine operator. Sanchez offered to dig out the mine fire at minimal to zero charge so long as he got to keep any coal recovered without having to pay royalties to Lehigh Valley Coal Company. Sanchez’s reasonable offer was rejected by both government and the coal companies, despite the fact that neither company was actively mining and had merely become absentee landlords since the coal industry gave way to oil and gas. Neither the government nor the coal companies wanted to pony up the cost for extinguishing the fire. On August 17th 1962, the contract was awarded to Bridy, Inc. – a contractor out of the nearby community of Mt. Carmel. Bridy’s bid was estimated to be around $20,000, although the records of the exact figure have been lost. Nearly all DMMI documents on the Centralia mine fire from 1962-1970 were conveniently “lost” by the DER. Bridy was unsuccessful at extinguishing the fire. For many years afterward, no one with the resources, private or public, cared about the fire underground. No one cared about the ecological and health hazards caused by the toxic emissions cocktail of hydrogen sulfides and carbon monoxide. No one cared about the fact that the largest deposit of the “forgotten” fossil fuel was going up in smoke – literally. 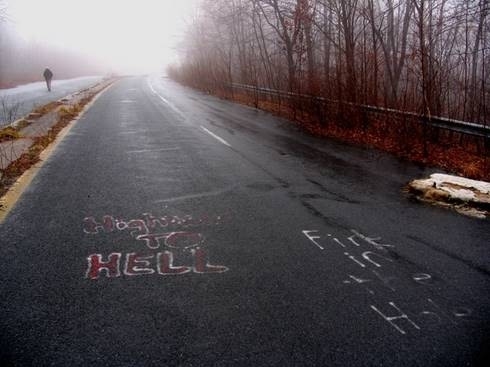 No one cared until Centralia was catapulted into the spotlight of the national media in 1981. On Valentine’s Day of 1981, 12 year old Todd Domboski decided to take a shortcut across his grandmother’s back yard when the ground beneath his feet suddenly gave way to a yawning chasm that was 150 feet deep. Todd narrowly missed death as he clung to an exposed tree root. The 752 degree heat from the subterranean inferno and the toxic gases would have killed him had his 16 year old cousin not immediately pulled him to safety. After the media fanfare, the government crunched the numbers and determined that the cost to extinguish the fire would cost $663 million, but the cost to relocate the residents and businesses of Centralia would only cost $42 million. The residents were offered a buyout. The state declared eminent domain, condemning the entire town in 1992. 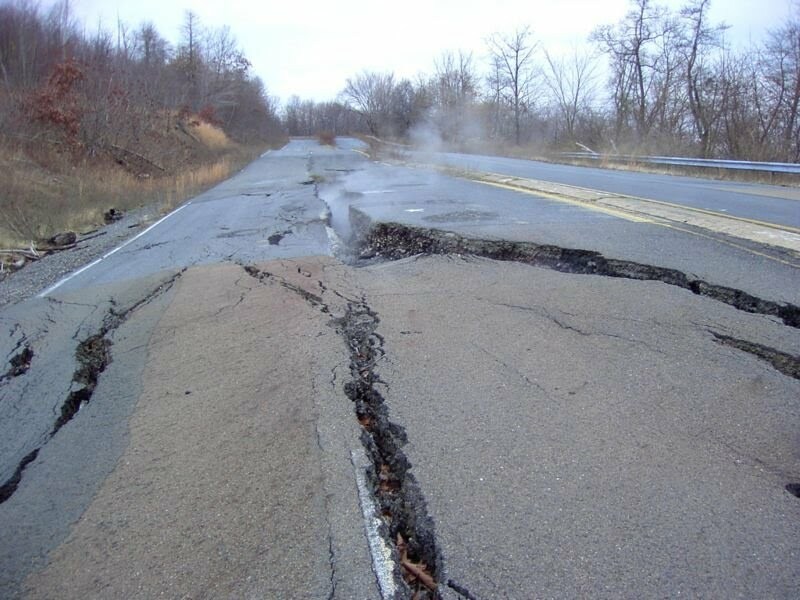 In 2002, the US Postal Service revoked Centralia’s zip code. The government now owns all the property in Centralia, including the homes of a few stubborn old timers who refused to move. Although they no longer technically own their homes, they’re still required to pay property taxes on them. The raging fire underground is headed towards Shamokin. By the time the fire burns itself out, a total of over 3,700 acres of anthracite coal will be gone, up in smoke. There is estimated to be enough coal to fuel the fire for the next 200 years. Yet, the government does not feel it is important to try stop this environmental catastrophe from spreading. Our elected leaders should have weaned America off of fossil fuels decades ago. But they didn't. We have had the technology for solar, wind and geothermal energy for the past several decades. Plug Power, a small upstate New York company, manufactures hydrogen proton membrane exchange fuel cell technology. Tempe, Arizona uses one of Plug's fuel cells to power the grid for the entire region of Tempe. California has begun investing in "wind farms." But "King Coal" and the rest of the energy cabal used their economic muscle to prevent widespread implementation of more affordable renewable energy. Solar and geothermal energy are solutions which only affluent property owners can afford. And that is solely the fault of our corrupt government for caving into the interests of greedy and socially/environmentally irresponsible coal, oil and gas cartels and utility companies. Most Americans are renters; they cannot afford to own a home – let alone a brand new home with a geothermal/wind/solar energy system. Furthermore, renters have no say as to what energy they’re hook up to because it is the landlord’s property. Until renewable and environmentally responsible energy can be provided at affordable prices to the majority of people, having a reserve of anthracite coal as a back-up could mitigate much unnecessary hardship and suffering. It would buy us time to make solar, wind, and geothermal more widely available to those most vulnerable to fuel poverty. Meaningful change will only happen when enough Americans demand - not meekly ask - for sensible and more affordable alternatives.